Learn more about the laws of supply and demand. Supply and demand in a market economy is one the most fundamental concepts in economics. Demand refers to the quantity of a product or service that is demanded by consumers. Supply refers to how much of the product or service the market can offer. The price of a good or service is greatly influenced by supply and demand and will usually settle at a point where the quantity demanded by consumers will equal the quantity supplied by producers. This economics course will review in detail the laws of supply and demand, how they operate in a market economy and how they determine the price of goods and services. 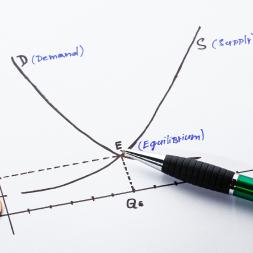 The course outlines factors that affect both supply and demand, and how there is an in-built price elasticity within supply and demand for goods or services. This economics course will be of great interest to all professionals in the areas of economics, finance, business and politics who would like to learn more about how the price of goods and services is determined, and to all learners who would like a greater understanding of the fundamental laws of supply and demand. Learning outcomes: - Understand the concept behind supply and demand; - Explain how supply and demand operate within a market economy; - Explain how price of a good or service is determined by supply and demand.